This is a scarce item, especially in such marvellous condition and with a decent original box too. Very few of these were sold as they were expensive and only available for a short time between 1959 and 1961. 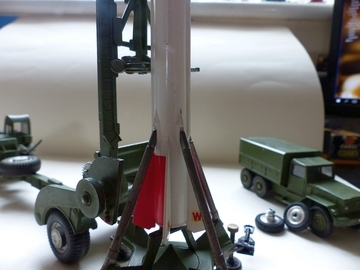 The Corporal missile is huge, much larger than the Thunderbird or Bloodhound released a little earlier. It sits on this intricately engineered launch device. That has four stabilisers which can each be folded out and adjusted so that the missile is held in a precise position. There is a tow bar too so that it can be pulled along on the two wheels. These wheels are removable. Lots of features for this early in Corgi days! This one is virtually immaculate - the missile will usually attract some scratches but this has all the original decals. Only the nose cone has been replaced but there is an original metal tip that comes with it. This was for the ‘cap firing’ element available on later models and it is possible to cut back the rubber nose cone to include the metal tip if desired.